Today, we begin the week that we call HOLY. We walk with Jesus on his way to his cross . . . to his resurrection. Come celebrate the good news of salvation. The Episcopal Church extends the Welcome of Christ. 8:30 a.m. This Sunday is Palm Sunday and we begin with the Blessing of Palms. The Passion according to Luke is read today by a variety of voices. We hope you will begin this Holy Week with us. 10:30am Palm Sunday continues. There will be the Palm Sunday Blessing of Palms with the Procession followed by the Celebration of Holy Eucharist. A reading of the Passion from the Gospel according to Luke will be proclaimed. Come begin this Holy Week with this glorious celebration of Christ’s entry into Jerusalem and enter into the depths of the story of our salvation in the coming week. Coffee/Fellowship Hour follows the 10:30 Service. Lincoln University Concert Choir will be in Concert at 3:30 PM TODAY. Come hear a concert not to be missed. On this night we begin the Great Three Days when we remember the Passover of Christ from death to life. We begin with the celebration of Holy Communion with the Washing of the Feet. Jesus washed the feet of his disciples and told them to wash each other’s feet in remembrance of him. We do this on this night to remind us that we walk in the footsteps of Jesus as we serve God’s people in the world. We celebrate Holy Communion on this most special night, remembering that Christ told us to take bread and bless it and break it and share it and when we did he would be with us. Following the service we will remain in prayer before the Eucharist until Midnight when we will close the Night Watch by praying Compline. This is the primary liturgy of Good Friday. It is the time when we remember the saving actions of Christ on the cross. It is a day of fasting and prayer that ends with the Veneration of the Cross. If you have never attended a Liturgy of Good Friday, this might be something you might like to consider. We begin the night with the lighting of the New Fire, the blessing of the Paschal Candle, and the singing of the Exsultet. The Great Vigil of Easter has Four Parts: The Lighting of the Fire, preparation of the Paschal Candle, and the singing of the Exsultet; Readings from the Old Testament telling the story of salvation followed by the ringing of bells, singing of the Gloria, and proclamation of the Easter Gospel; the third part is the Renewal of Baptismal Vows; and finally we celebrate Holy Eucharist in the presence of the Risen Lord. On Easter Sunday, we have a joyous celebration of Christ’s resurrection at both the 8:30 AM and the 10:30 AM liturgies. Music will fill the air as we sing that Jesus Christ is Risen Today. Alleluia! Children will unveil the Alleluia that has been buried throughout the season of Lent. Come celebrate this joyous day with other members of Christ’s body. St. Christopher’s is so happy to be able to provide a hearing loop to those who wear hearing aids. Just switch your hearing aid to ‘T’ to access the loop. If you do not wear a hearing aid and wish to have the benefit of the loop, you may ask the ushers and they will give you a headset to use. 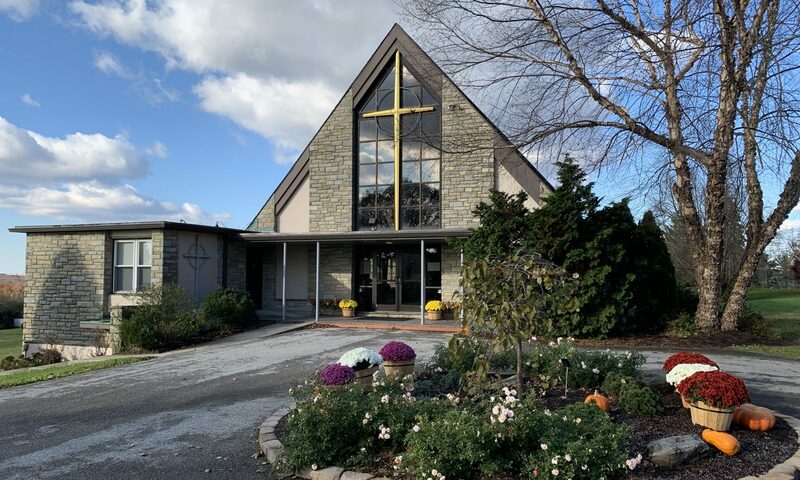 St. Christopher’s Episcopal Church is a parish in the Diocese of Pennsylvania of the Episcopal Church and part of the Anglican Communion. The Rt. Rev. Daniel G. P. Gutierrez is the 16th bishop of the oldest diocese in the country. “We Are Revolutionary” is a statement defining our diocese. As the first diocese and place of the founding of the Episcopal Church and home of the first Presiding Bishop, Bishop White, this diocese has long been known for its leadership and witness. At St. Christopher’s, we continue to take seriously the mission to make disciples by spreading the good news of Christ’s love. #Know Jesus. #Change the World. Celebrant: Will you continue in the apostles’ teaching and fellowship, in the breaking of bread, and in the prayers? People: I will, with God’s help. Celebrant: Will you persevere in resisting evil, and, whenever you fall into sin, repent and return to the Lord? People: I will, with God’s help. Celebrant: Will you seek and serve Christ in all persons, loving your neighbor as yourself? People: I will, with God’s help. Celebrant: Will you strive for justice and peace among all people, and respect the dignity of every human being? People: I will, with God’s help. It goes by several names: Holy Communion, the Eucharist (which literally means “thanksgiving”), the Mass. But whatever it’s called, this is the family meal for Christians and a foretaste of the heavenly banquet. As such, at St. Christopher’s, all of the baptized are welcome to receive the bread and wine and be in communion with God and each other. Music in the Episcopal Church can be as diverse as its worship services. Although final authority over the music used in an Episcopal service is “the duty of every Member of the Clergy” (Title II: Canon 5), our hymnal draws all Episcopalians together musically in the same way that the Book of Common Prayer draws us together in prayer and liturgy. Most recently revised in 1982, The Hymnal 1982 of the Episcopal Church offers 720 hymns in addition to liturgical music. While some of the hymns date back to monastic chants, the hymnal offers more modern music as well. Additional hymnals including Wonder, Love and Praise, which continues the hymnal’s expansive use of music from a variety of sources including more contemporary liturgical music, and Lift Every Voice and Sing II (LEVAS II) which contains music especially from the African American musical tradition. The Hymnal 1982 retains the best of the past and sets forth many riches of our own time. [The Standing Commission on Church Music] looked for theological orthodoxy, poetic beauty, and integrity of meaning. At the same time, the Commission was especially concerned that the hymnody affirm ‘the participation of all in the Body of Christ the Church, while recognizing our diverse natures of children of God.’ … Texts and music which reflect the pluralistic nature of the Church have been included, affording the use of Native American, Afro-American, Hispanic, and Asian material –Preface, The Hymnal 1982, Church Pension Fund, 1985. Donna Topping was the Organist for St. Christopher’s for decades. The last time that she played a liturgy here was Christmas, 2012. Early in 2013, she suffered an injury and has not been able to return to the organ bench. We still miss her and hearing her beautiful music and are happy to be able to share the last time that she shared her gifts of music on Christmas. A group has been started here at St. Christopher’s with leaders trained by the Alzheimer’s Association. The Alzheimer’s Caregivers Support Group is now meeting the FIRST Saturday of EVERY month. It is intended be a group that will support anyone who is caring for a person who has Alzheimer’s, dementia, or any other memory issue. This is a group where you will receive materials to help you learn more about the disease and how to care your loved ones. Please spread the word if you know someone who might need a group like this. It is open to caregivers throughout the area. Come and receive a little care for yourself and leave feeling encouraged and supported. Then on May 3, a favorite, Charlie Zahm will return to St. Christopher’s for a great spring concert. This will be a Tribute to the Folk Music of the 60s and John Denver! This Concert is on Friday at 7:30 PM. You will start your spring off right with these two great concerts! You do not want to miss these outstanding performers. Doors open at 7:00 PM and tickets are available at the door. Go to The Friends Folk Club on Facebook and like their page. Tell us that you are coming. We will have refreshments waiting and a good time promised for all. A big thanks to Mary Louise Bove and The Friends Folk Club for sharing such talent with the community. What a great way to share an evening – good friends, great music! Thank you to all who have brought shoes to the church for the Shoe Drive. Funds2Orgs will soon come collect them for distribution to small businesses in developing countries. We collected 54 bags! That is an amazing amount for us. We especially want to thank those who worked so hard to wrap and bag the shoes. Your generosity was inspiring. Many people will be helped because of it. Get started at St. Christopher’s Episcopal Church @ smile.amazon.com. 8:30 a.m. is a quieter and more reflective celebration of Holy Communion. At the 10:30 a.m. liturgy, we worship in prayer and song. Congregational singing is an important part of our worship and we sing hymns and songs using both traditional and contemporary resources. The choir and musicians add beauty and spirit and liturgical ministers of all ages serve in various capacities throughout the liturgy. The full and active participation of all who gather is important, including our children and youth. All are welcome in this place. At 9:30 each week, we offer Christian Formation and Education, for all ages, between the services.